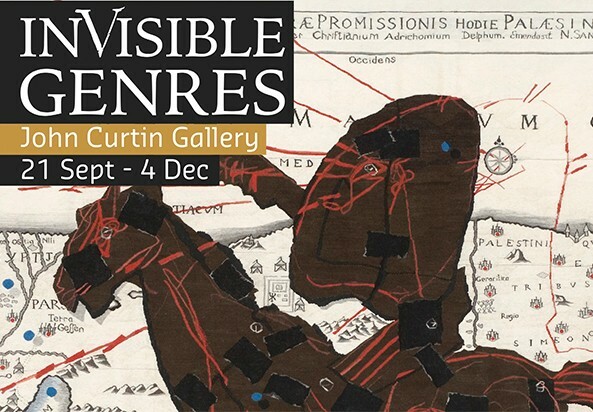 In 2016, on the 400th anniversary of the first European landing on the coast of Western Australia, the contemporary art exhibition Invisible Genres foregrounds the possibilities of this often-overlooked Dutch 'discovery'. Gathered around an important work by the Dutch video artist Wendelien van Oldenborgh, Invisible Genres draws together the works of several generations of Western Australian artists, major pieces by the South Africans William Kentridge and Candice Brietz and the paintings of the undiscovered Balinese master Dewa Putu Mokoh to provide new insights into our part of the Indian Ocean world. Underlying Invisible Genres is the view that the innovations made by Dutch artists during their Golden Age in the 17th Century were a product of the democratisation of commerce and art which led to the energising of those kinds of art or genres that escaped the dogmas of the Catholic Church. Invisible Genres derives its themes from the four most common types of Dutch painting: portrait, landscape/seascape, still-life, and genre, the art of depicting everyday life. Commemorating the anniversary of Dirk Hartog's landing in north Western Australia with an exhibition of contemporary art rather than with an exhibition of centuries-old paintings and maps, Invisible Genres emphasises the continuing ramifications of the connections and parallels that exist between the four countries, in their histories and politics. Having van Oldenbourgh's No False Echoes at its core, a work that addresses the issue of the Dutch colonial history in Indonesia, Invisible Genres also uses the work of important artists from Bali and South Africa to reframe local art. The exhibition includes work of the painters Julie Dowling, Gregory Pryor and Joanna Lamb, photographers Tony Nathan and Jacqueline Ball, the sculptor Abdul-Rahman Abdullah and the interventionist PVI Collective. Instead of viewing history as a thing of the past, Invisible Genre's kind of reframing of history is a means of reimagining the present. As Wendelien van Oldenborgh has said, echoing the American novelist William Faulkner, The past isn't over; it's not even past. William Kentridge, Jaqueline Ball, Gregory Pryor, Joanna Lamb, Abdul-Rahman Abdullah, Tony Nathan, PVI Collective, Wendelien Van Oldenburgh, Julie Dowling, Candice Brietz and Dewa Putu Mokoh.